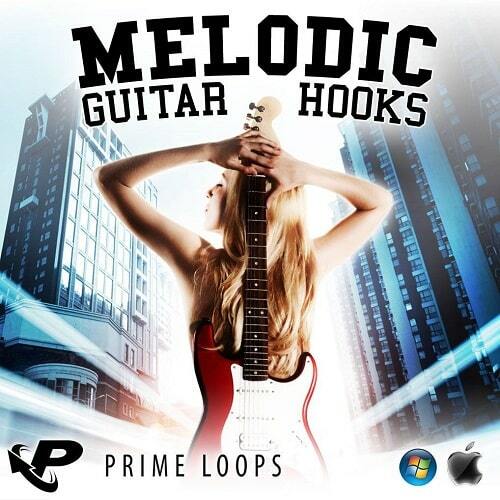 Kick out the jams with “Melodic Guitar Hooks”, the glowing hot guitar sample pack fresh from the Prime Loops audio lab! We’ve been surfing our fretboards to bring you an epic array of home grown Guitar Samples, lovingly crafted to fit snuggly in your next smash-hit anthem across a vast ocean of genres! This ultra-melodic collectionof Guitar Samples captures all the strummed and plucked Pop, Rock and R&B class of today, from the strings of Gotye, Ed Sheeran and Rizzle Kicks to Adele and Arctic Monkeys – these riffs are more up-to-date than the clock! – Ballad Hooks [75-90BPM]: steady the tempo with some sweet lulling tones for your Pop and R&B jams. – Steady Riffs [95-115BPM]: keep it solid and roll out some funky R&B licks amongst some big Rock riffs. – UpBeat Jams [120-140BPM]: pump up the beat and throw some agile and energetic chord progressions and sleek notes into the mix. This pack is instantly available via direct download and all 340MB are 100% royalty free. You’ll even save money on strings! So if you’re looking for a diverse selection of 6-string sounds without working your fingers to the bone, get your hands on “Melodic Guitar Hooks” now! From John Mayer to Santana by way of Jimi Hendrix, this ultimate guitar sound library guarantees to add some Rock and Pop melody to your tracks!